Steve and I have had a delightful time traveling over the past several weeks. We’ve been in England and then in Kenya, speaking at a conference run by one of our partners for missionaries. What a joy! Everywhere you travel in the UK, before you get on the tube (subway) or an airplane, there’s a sign that reads “Mind the Gap.” It’s reminder that there’s a gap between where your feet are planted and where you need to step. In the same way, there is often a gap in our thinking, between our expectations and what actually transpires. In those moments, disappointment floods our heart, and it’s easy to take offense or spiral down into negative thinking. The Apostle Paul reminds us in Philippians 4:8 what’s to govern our thinking: “Finally brothers and sisters, whatever is true, whatever is noble, whatever is right, whatever is pure, whatever is lovely, whatever is admirable – if anything is excellent or praiseworthy – think about such things.” So when life throws us a curve ball, relationships disappoint, or circumstances cripple – we need to mind the gap in our thinking. How do we do that? What is the truth in this situation? Often when we’re traveling, there are very long lines going through passport control or security. The transport security people in any given country are not always pleasant. If I set my mind that we’re going to get through security quickly and easily, I experience disappointment – almost every time. Just yesterday when we arrived in London from Kenya, it took a solid hour to get through passport control. The lines were long and the place was mobbed. My first inclination was to groan inwardly and complain. 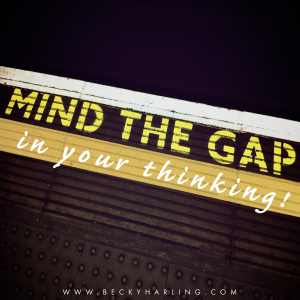 As I looked at the massive mob of people in front of me, I knew I had to “mind the gap” in my thinking. So internally, I asked myself, What is the truth in this situation? The truth was, it would take a while, and we needed to be patient. The truth was, we would get to our hotel to rest, but not as quickly as I had hoped. What are some noble characteristics of the person who disappointed me? Our friends and loved ones are not perfect. Instead of spinning a story in your head about their intentions, choose to focus on their positive character traits. Likely, they didn’t mean to hurt you. Most often people are just too wrapped up in their own chaos to meet the need you might have. This is understandable. Don’t assign motives. Instead, offer grace. Focus on the person’s nobility. After Jesus rode into Jerusalem triumphantly, on the back of a donkey, the disciples probably thought this was the magic moment when Jesus would set up His kingdom on earth. Imagine their disappointment when just a short time later He was crucified. Don’t you wonder how they processed those events in their thinking? I wonder if they came up with personal plans to mind the gap in their thinking by rehearsing all the truth they knew to be true about Jesus? Next time someone disappoints you, “mind the gap” and make a list of the person’s most noble character traits. Where is God in this disappointment? I remember a season in our daughter’s life when she didn’t make a certain choir at a state university. She felt devastated in that moment, and her thinking began to spiral down into thoughts of “Maybe I’m not good enough. Maybe I really can’t sing.” I remember saying to our teen, “Maybe God has a different plan.” As she considered that question, she applied to a Christian university that had a dynamic worship arts program. She worked hard on her audition piece and crushed it. The years Keri spent at that university were life changing for her, and she now is an accomplished worship leader. When disappointment hits, it’s best to “mind the gap” and ask yourself, Where is God in this? Is He leading me in a different direction? Does He want to develop humility in my life? Here’s what I know: God can use even the most disappointing circumstances to shape and mold us into the image of His Son, Jesus Christ. After traveling for the last few weeks, I’m home! I’ll be writing and spending time with grandkids over the next few weeks. After being overseas the last few weeks, I realize how urgent the need is for more workers. Jesus asked us to pray to the Lord of the harvest to send out more workers (Matthew 9:38). Would you join me in praying as we seek to raise up more missionaries in Reach Beyond? And also, I hope you have a blessed and joy-filled Easter! He is risen indeed! So great to hear from you, Carol! Much love to you!! !